I bet you didn’t realize yesterday’s blog post had a Part 2! Well, it does. Let’s see, when we left off, Binga had crashed my nip party. 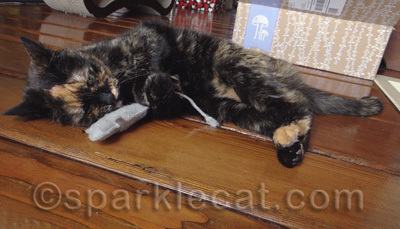 I was mad but my human tried to console me with one of the cool nip toys from Edgar’s Attic (reminder: you have until June 15 to get 15% off purchases of $10 or more with the code SPARKLE15). But as if having the fresh nip to herself wasn’t enough, look! It’s the party crasher again. Some days it’s just impossible to enjoy yourself in peace. 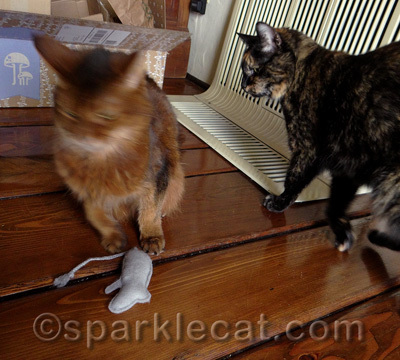 Binga proceeded to kill my toy! Luckily, it is very sturdy and it did not stay killed. Was there a Part 3? Yes, there was, but this has gone on long enough. Suffice it to say that it ended with several tufts of Boodie fur stuck to the rug. Was there a rumble among the fair Ladycats? 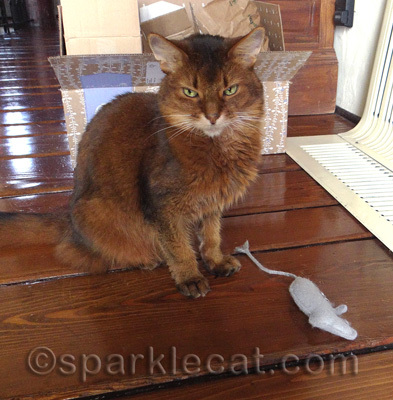 Sparkle, the Bein MUST provide you a Special Nip Place somewhere! ha,ha..the clever cat gets the catnip! LOOK! It’s a Boodie Sighting!! WOOT! At least you keep you human entertained! Boodie must have thought it was her birthday getting all the nip to herself. I know Sparkle, you can only take so much!!! Sparkle all of that happens around here too with the 5 of us. There’s always something exciting going on at your house! I hope you boxed everyone’s ears for stealing your stuff. That is just unacceptable. Boodie is the lucky kitty to enjoy the nip! Yikes! Fur does get flyin’ sometimes when the nip is involved! Boodie is such a laid-back kitty – but ever so pretty! We think Boodie got the best deal until she was discovered and a tussle ensued. It looks like you need to find a place to stash your nip! 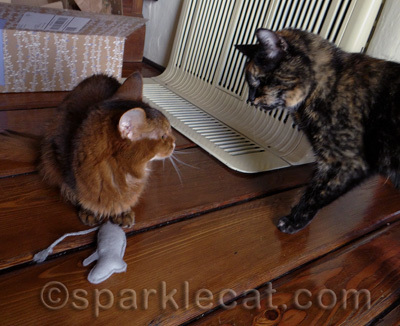 Binga, you need to get a life of your own and leave our Miss Sparkle alone with her nice toys and nip. Hope you all got things straightened out. Two Two is just like Binga. Always in someone else’s stuff. Take care. Sisters can be a pain in the b–t sometimes especially when they steal your nip before you’ve even savoured that first deep sniff. Why is there never enough nip to go round? 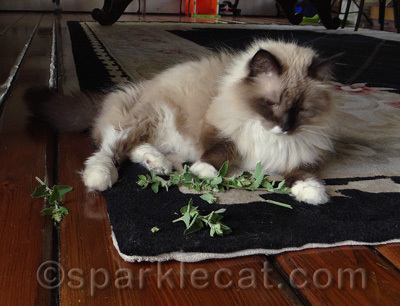 Sometimes you just can’t get any peace … or a piece of nip! Happy Friday! 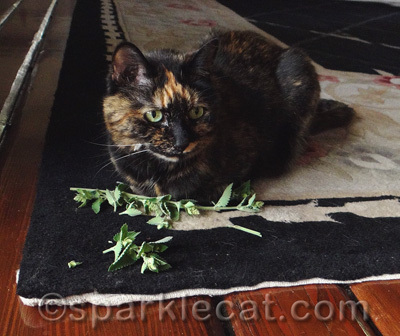 Do you think Binga might need an intervention? How cute you ladies are. by yourself so you can enjoy that cool toy and have some fresh nip! !